Little People. High and low, high and low; up in the sky and away they go! Lights, sounds, talking, and a fun sing-along song helps your child's imagination take flight while he learns about "high" and "low" with a little help from the Little People! Fisher-Price's Little People figures wiggle and wobble as kids spin the airplane wheel. The toy's easy-carry handle helps pretend flights soar through the sky. 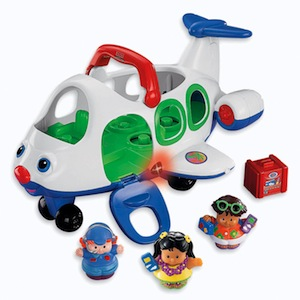 The Lil' Movers Airplane includes the toy plane and 3 Little People figures: Mia, Roberto, and a pilot! Requires 3 "AA" batteries. Ages 1-4 years old.